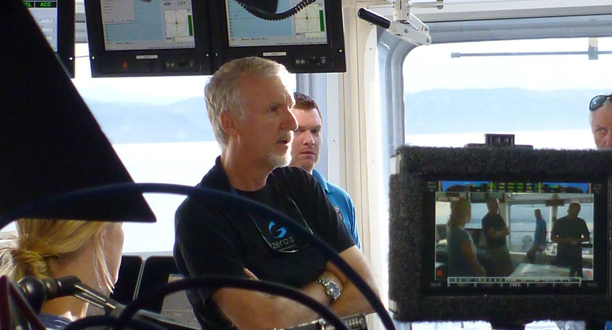 Today, the DEEPSEA CHALLENGER became the world’s deepest diving submersible in operation, and Jim reached the greatest depth ever achieved by a solo pilot. But the planned 26,247-foot (8,000-meter) dive ended abruptly before the sub could reach the floor of the New Britain Trench. Late in the afternoon, just before launching the sub, a low-lying cloud cast a shadow over the ship. It was oval-shaped, with a dark underbelly that spawned a slim, swirling waterspout. When it scattered raindrops across the deck, one of the deckhands standing next to the sub lifted his arms skyward, closed his eyes, and beamed. For the moment, he was free of the fiery, tropical heat. At 4 p.m. the ship’s big boom crane picked up the sub and lowered her into a calm ocean. As she entered the water, the tag line under the crew sphere jammed on deck and lost tension. For heart-pounding seconds, the lower half of the sub disappeared under the ship. (“I had an in-your-face view of the starboard tunnel thruster,” said Jim after the dive.) Captain Buckle applied power to both thrusters and main engines, shifted the ship sideways, and the sub swung back into view. An hour after leaving the surface, the vertically shaped sub had sliced through the sunlit layers of the ocean—the twilight zone—and was deep in darkness. As Jim passed through Titanic’s depth at 12,500 feet (3,810 meters) he gave a short wave of acknowledgement to the ship that had been his muse. Soon after, he was at 16,000 feet (4,877 meters), the depth of the Bismarck. Ten years earlier, he made six dives to the German battleship and co-authored a definitive paper on the forensics of the wreck site. Minutes later, he flashed past the maximum working depth of the Russian Mir subs designed by his mentor, Dr. Anatoly Sagalevitch, and was approaching the operational limits of the Japanese and Chinese research subs Shinkai and Sea Dragon. Everything inside and outside the sub, including 3-D cameras and voice communication, was working well. Two hours after leaving the surface, he shot through 23,487 feet (7,159 meters), the depth that made the DEEPSEA CHALLENGER the world’s deepest diving sub—and the greatest depth ever achieved by a solo pilot. As the depth increased, the sub’s six vertical thrusters began to switch on and off. They ran for one minute and stopped for thirty seconds. The start-stop rhythm became intermittent and repetitive. There were parallel problems with the hydraulic system that opened the science door and operated the manipulator. Jim checked his pilot procedures and trouble-shooting manual, but neither malfunction responded to the numerous adjustments he made inside the pilot sphere. 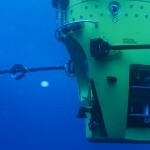 In addition, something, possibly a strong current, seemed to be pushing him well south of his seafloor target. The bottom of the trench was getting closer and he was approaching it twice as fast as the Russian Mir subs. His hundreds of hours inside the Mir subs told him it was time to slow down. He dropped steel shot for fifteen seconds and repeated this procedure twice. The sub maintained its downward speed. Being a cautious man, he dropped shot for forty-five seconds. Bathed in its own lights, the 24-foot-long (7-meter-long) sub slowed, came to a stop at a depth of 23,818 feet (7,260 meters) and, without warning, started to rise. The DEEPSEA CHALLENGER is a marvel of wire-linked computers and microprocessors. Every major system—including 67 lithium ion batteries, 20 junction boxes, 7 cameras, 6 multi-bus boxes, and 3 LED spotlights—has a microprocessor at its electronic heart. Many of these tiny logic boards are having digital conversations with each other. The “brain” in the system, the PAC, had recently been reprogrammed to log battery data. As the hours passed, this data file increased in size and the microprocessor collecting it had to pause to ensure all the data was written into its memory. This pause inadvertently switched the thrusters off. When the electronic transaction was complete, the thrusters came back on. The engineers in the control room discovered the software problem, but it was too late to turn the sub around. Jim had dropped the ascent weights and was heading up. This is a man whose fear is held in check by his competence, confidence, and commitment. He knows that when you’re inside the fierce momentum of a major project, it takes courage to be cautious. 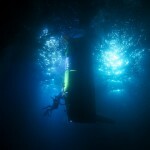 Filed under Expedition Journal and tagged 8000 meter dive, milestone, record.